On 31st October 2018, Prime Minister of India, Shri Narendra Modi inaugurated The Statue of Unity – World’s Tallest Statue. 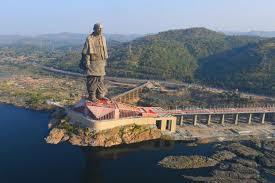 The statue of Unity is a colossal statue of independence activist Sardar Vallabhbhai Patel (1875–1950). It is located in Sadhu Bet, a river island in the River Narmada, in the Narmada district, near to the city of Vadodara in Gujarat. On 7th October 2010, Narendra Modi first announced the project as a commemoration of Sardar Vallabhbhai Patel. Ram V. Sutar has designed the statue. Who was Sardar Vallabhbhai Patel? Vallabhbhai Patel, popularly known as Sardar Patel, was an Indian politician. He served as the first Deputy Prime Minister of India. He was an Indian barrister and statesman, a veteran leader of the Indian National Congress and a founding member of the Republic of India who played a leading role in the country’s struggle for freedom and guided its integration into a united, independent country. In India and outside, he was often called Sardar, meaning “chief” in languages like Hindi, Urdu, and Persian. He was the de facto Commander-in-chief of the Indian army during the political integration of India and the India-Pakistan War 1947. His uncompromising commitment to national integration in the newly independent country, earned him the special title “Iron Man of India”. A consortium comprising Turner Construction, Michael Graves and Associates and the Meinhardt Group supervised the project. It took 56 months to complete the whole project. Indian infrastructure company Larsen & Toubro won the contract at the lowest bid of US$420 million for the design, construction and maintenance. The Statue of Unity is 182 metres (597 ft), 54 metres (177 ft) taller than Spring Temple Buddha, the previous record holder of the World’s tallest statue. the statue’s surface (skin) has 553 bronze panels – each panel has 10-15 micro panels – made at a Chinese foundry, as there was no facility available in India to make panels of this scale. A couple of high-capacity elevators with speed of 4 meters per second are there to reach the viewing platform at 153 meter. On November 1, the statue was opened to the public after the inauguration ceremony on 31st October 2018. It is estimated that over 128,000 tourists visited it in 11 days since its opening. 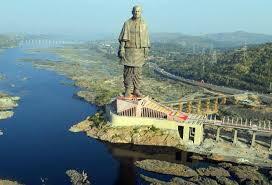 The Statue of Unity will have a viewing gallery at 153 m, which can accommodate up to 200 visitors at a go. The gallery will give an extensive view of the dam and environs. This colossal statue can withstand a wind velocity up to 200 kmph, and earthquakes measuring 6.5 on Richter Scale at a depth of 10 km and within a radius of 12 km of the Statue. For those planning to visit the spot: Tickets can be booked online via www.soutickets.in or mobile app or manual purchase of tickets at the counter. For adults, ticket fare is Rs 120 and for kids it is Rs 60.